Myariah Summers writes and performs under the name Jane Handcock. Myariah Summers sits by a big glass window, stirring her mocha with a spoon, at a downtown Oakland cafe. A black-and-white, patterned bucket hat hovers above her eyes, with her face framed by giant gold hoop earrings that dangle side to side when she laughs. The 27-year-old singer, who goes by the stage name Jane Handcock, would have driven to this interview from her home in Hercules, but she went blind in her right eye due to complications from an autoimmune disease about three years ago. "Lupus kind of attacks my body in different ways," said Summers, who regained much of her sight after a cornea transplant. "It definitely attacked my eyesight for a while. But I get around like regular people. A lot of people didn't even know I was even going blind because I hid it well." Even though the disease can be a challenge for Summers, it hasn't impeded her music career. Her handiness as a hip-hop and R&B songwriter has helped her build a sizeable network of producers, engineers, and industry folks, who call her up when they are lacking an essential, yet sometimes elusive, element of music: a good song. She's worked in the studio with New York rapper Ma$e, Blackstreet singer Teddy Riley, and longtime friend and collaborator Adrian Marcel. She's been called a "musical medium" by East Bay R&B mainstay Raphael Saadiq, who executive produced her first two mixtapes. She even wrote a song for ex-Destiny's Child singer Kelly Rowland, which appeared on Rowland's 2013 solo album, Talk A Good Game. "It's a blessing because it's just like — I really just work off of my relationships," Summers said about writing for Rowland in Atlanta. "It was one of those things where they were like, 'Hey, can you come in and write?' And I was like, 'Yeah, I can do it.' And she ended up picking my song that day." While she still works for other musical acts — songwriting pays her bills — a couple of years ago she decided to start writing for herself, too. "I feel like I'm in a weird place. I'm catching BART and I'm trying to make sure that I've got enough change in my pocket for that, but I'm in talks with all these people who could really change my life, just financially and I guess all around," said Summers, who is currently an unsigned artist. "And they're just waiting on me and they have their eyes on me right now." While Summers learned how to mix, record, and perform in high school at Oakland School for the Arts, her real music education began in 2012, when she moved to Atlanta. She moved there on the recommendation of her friend Adrian Marcel, an Oakland singer and Atlanta transplant who had just signed a record deal with Universal Republic. ("You just write and you can get your foot in the door by writing," he had told her). The move brought huge change to her life, allowing her to quit her job as a graveyard shift security guard for a Richmond hospital to pursue her passion for recording full-time. The work started off small, mostly writing songs with Marcel. Then, she started working with her previous manager Yancey Richardson, who got her in the studio with big-time producers and pushed her to write as many as three songs a day. "He would throw me in these situations," said Summers. "It would be a session with someone big like J.U.S.T.I.C.E League. They do a lot of stuff with Jay-Z and Rick Ross. And he'd throw me in there like, 'OK, she can do it. She can write.' And I'd have to do it in a timely manner because I would be so pressured." While she described these times like "boot camp," she feels much stronger as a songwriter and performer because of them. "He'd throw me in the line of fire, but he did it, I feel, to really just get me to be quicker and a beast when it comes to recording," said Summers. "I learned all of that in Atlanta." Since returning to the East Bay in 2015, she has released two mixtapes. Her debut, Truth Be Told, is varied, exhibiting her soulful range over an array of styles, from clubby hip-hop to dreamy alt-R&B. 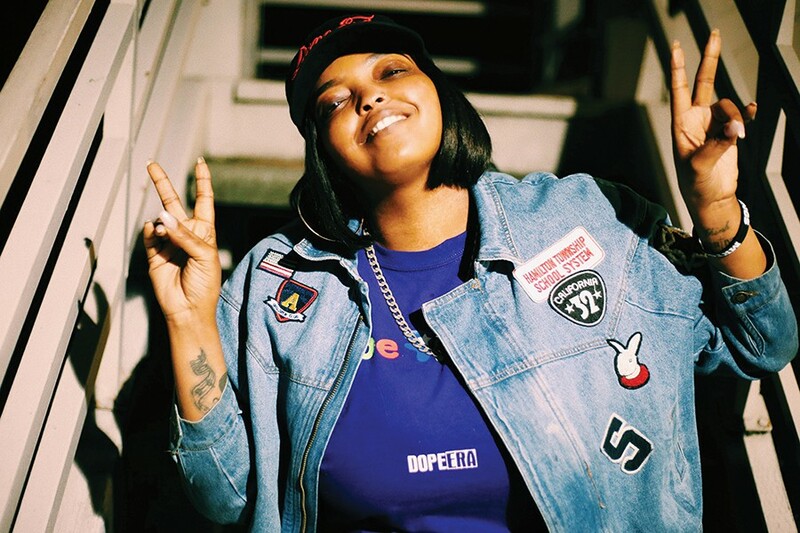 Her 2017 record, Truth Explains a Lot, is more focused, melding her love of East Bay hip-hop's underpinnings — from its ease of style to its celebration of individuality — with her passion for Atlanta's trap scene. Summers's new song, "My N***a," has her shedding the sounds of modern hip-hop for more vintage sonics. It's more in the lane of '90s R&B artists like Erykah Badu or Lauryn Hill than the bass-heavy and hi-hat tittering sounds of today's hip-hop radio. After talking to Summers, it's clear that this is no accident. "I care about legends," said Summers, who is currently gathering material for a new album. "I'm aware — I'm hip to what needs to be done to be relevant.... But I don't study those people. I study the greats. I study Stevie Wonder, Missy Elliot, Gladys Knight, Roxanne Shante." The ex-Trails and Ways member never meant to start a shoegaze project. After suffering a string of personal tragedies, the East Bay rapper emerges from a "spiritual hibernation."